The new Maps Connect tool is aimed at small business owners who want to add information to create an Apple Maps listing or modify an existing description with additional details, reports Search Engine Land. According to the publication, which went through the setup process, owners can sign in using a current Apple ID —or sign up for one —and begin using the service for free. To add a new business, users first enter the name, address, phone number and affiliation with the company. A verification code sent via automated phone call is then entered in to Maps Connect tool. Alternatively, business owners can verify through an email address affiliated with their company's website, provided they have one. From there, users can select from a number of detail options, including location, business categories, hours of service and links to social media and Yelp. 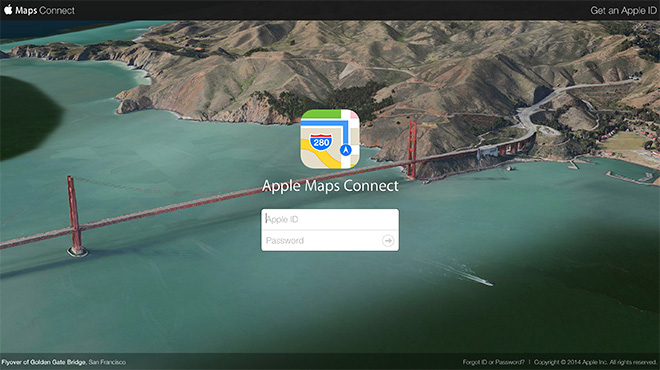 Search Engine Land says changes are uploaded to Maps servers and usually appear on consumer-facing iOS and OS X apps within one week, though publication time may vary depending on Apple's vetting process. Apple also incorporates anti-fraud techniques in Maps Connect, but failed to explain exactly how those measures work. Finally, Maps Connect asks businesses to sign up for iBeacon installations, though requirements for acceptance into the program are steep as Apple has seen an "overwhelming response" to the service. In addition to an annual visitor rate of at least one million customers, businesses must have Wi-Fi, accurate and scaled maps and an app with which to support iBeacon features. Apple has been working toward a more accurate and comprehensive mapping system since the first Maps app launched in 2012 to stinging reviews. Along with "Ground Truth" managers responsible for fact checking and in-person data gathering, Apple's Maps team includes members working on Flyover enhancements, data collection and more.